I have two sets too! 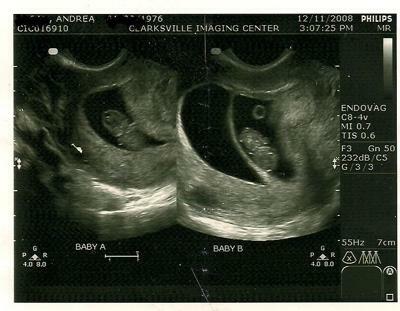 I was also 8 weeks along when I found out I was having my second set of twins who were also 10 years old. I thought the technician was joking around with me. I was in shock the rest of the day. I don't think anyone is ever ready for that kind of news, even with previous experience. It's not like we grow up hearing our parents say- "now when you're a mommy and have two babies growing in your tummy...". Congratulations. I gave you a 5 because that's a really clear ultrasound- nice pics of the babies.